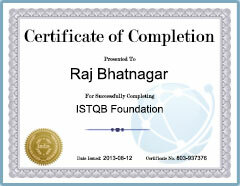 Pass Your ISEB or ISTQB Certification Exam with Confidence - Guaranteed! There is no longer a need to spend a small fortune to prepare for your ISEB or ISTQB software testing certification exam. Our self-study training courses are designed as a cost-effective alternative to the usual two or three day instructor led courses, which are expensive. You will receive the same level and quality of education as any instructor-led class, but at a fraction of the cost. All of our self-study training products are 100% guaranteed to fully prepare you to pass your certification exam with confidence. Our objective at IndiaISTQBExam.com is to help IT professionals train for and earn their ISEB, ISTQB or CTFL certifications. By using our study packages to prepare for your ISEB Foundation, ISEB Intermediate, ISEB Practitioner, ISTQB Foundation / CTFL, or ISTQB Advanced (CTAL) exam, you can be confident you are using the most accurate and complete self-study training package available. We maintain our high quality self-study guides and practice exams for ISEB Foundation, ISEB Intermediate, ISEB Practitioner, ISTQB Foundation and ISTQB Advanced certifications by ensuring that our products are developed by IT professionals with substantial training and certification expertise. This allows our customers to fully absorb the information and go into their certification exams with confidence. Our products provide a great, cost-effective alternative to textbooks and classroom training.